Nunweiler’s Buckwheat Mix contains 97% organic ingredients. It’s simple to make and tastes just like Grandma’s. 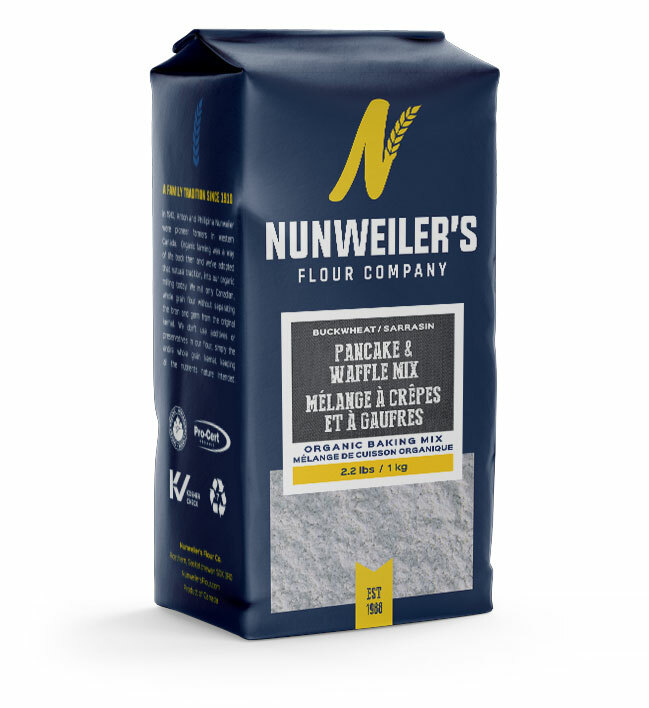 Made by the millers of the finest quality pancake and waffle mix. Since 1988 Nunweiler’s has been milling whole grain flour without separating the bran and germ from the original kernel. No additives or preservatives are used in the flour, just the entire whole grain kernel. The mix is easy to make, just add milk, oil, and eggs (optional). You can use any type of dairy product such as rice, soy or coconut milk. The pancakes or waffles are great on their own but you can get creative and add some fruit, chocolate chips, nuts etc. Your options are endless. Place 1 cup mix in bowl. Add 1 cup milk, 1/8 tsp oil and 1 egg (optional). Stir until blended. Turn when bubbles start to form and edges appear dry. Makes 10 four inch pancakes. Add 1 cup milk, 1 tbsp oil and 2 eggs. Stir until blended. Organic Whole Grain Wheat Flour, Organic Whole Grain Buckwheat Flour, Non-aluminum Baking Powder (Mono-Calcium Phosphate, Sodium Bicarbonate), Sea Salt.